This well-designed plan provides many amenities that you would expect to find in a much larger home. The master suite features a wonderful bathroom with large walk-in closet. This plan also features a flex space which could be used as a fourth bedroom or an office. The great room has gas logs as well as built-in cabinets and 10' ceilings that make it a great place to relax and spend time with family and friends. The rear covered porch provides a great space for those summer cookouts. This plan is the perfect solution to your family's needs. Question: Do you have this floor plan in a house with siding? Can this house be built 5/8 feet above ground? 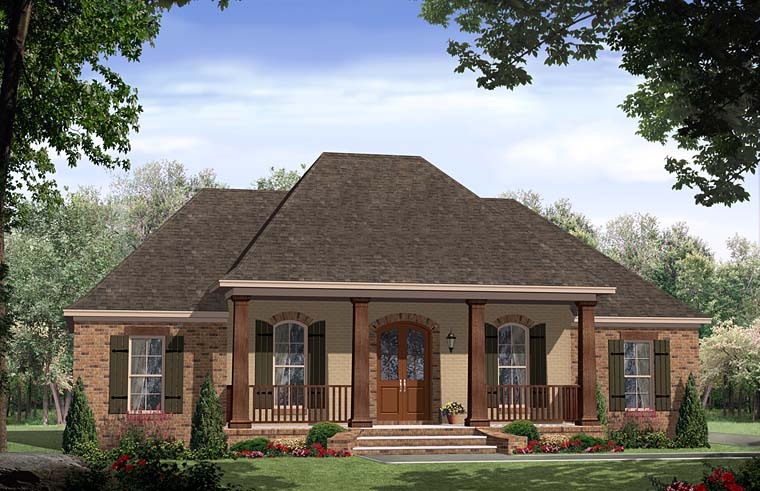 Answer: Hello, See plan 59952 for a siding version of this same floor plan. The other plan has gabled roofs, instead of hipped, but it could be done with hipped roofs and siding. Your builder can change the exterior finishes on site too. Any house can be built 5 to 8 feet above the ground. You may want to choose the crawlspace foundation option for that height. It would be less costly to build than a 5 to 8 foot slab due to the cost of the back fill dirt, etc... and then you can add an exterior door or access panel to use all that free storage space under the house. If you wish to modify either plan, just send us a list of the changes to obtain a quote. Thanks. Question: Do you have a YouTube video to this plan? Answer: Hello, No, we do not have a video of this exact plan. We do have the same floor plan with a different exterior though. The interior is the same. You may like to see it. Go to youtube and search for HPG 1870 You will see the video there . The shape of the floor plan and all the interior layouts are the same. The exterior is totally different, so just ignore that. Perhaps it will be helpful to you. Thanks. Question: Do you have this plan with a garage and without the flex space? Answer: See plan 59937. Thanks.